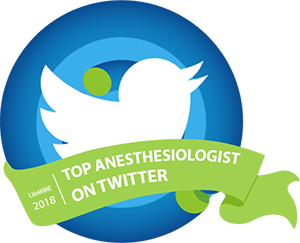 Let me tell you a little about what goes on behind the scenes during a typical case that I do quite often: anesthesia for lung surgery. The surgeon’s goal is to remove all or part of a patient’s diseased lung, often because of cancer. The first step involves my interview and physical examination of the patient. Next, I start the IV if the patient doesn’t already have one, and give appropriate premedication — for example, to help the patient relax, or to prevent nausea. Then the nurse and I bring the patient into the operating room, assist the patient in moving from the stretcher to the OR table, attach appropriate monitors for heart rate and blood pressure, and position the patient comfortably with warm blankets. While I’m busy with these tasks, the surgical team is setting up the operating room, counting instruments and making sure that all the equipment is ready. All this takes at least 20 minutes, often longer. None of it requires the surgeon’s presence. At this point, I give the patient oxygen to breathe through a mask and I start the appropriate medications to induce anesthesia, taking into account any underlying health problems the patient may have, such as high blood pressure or heart problems. As the medications go into the IV, the patient stops breathing and I take control of the ventilation. Then I insert a special breathing tube into the airway. This tube, called a double-lumen tube, allows each of the patient’s lungs to be ventilated separately. The lung with the cancerous tumor needs to be collapsed and motionless while the surgeon operates on it. The other lung is ventilated. I have to position the tube precisely with a fiberoptic bronchoscope so that it functions properly — allowing full collapse of one lung and effective ventilation of the other, and making sure that the patient receives plenty of oxygen. Once I’m happy with the position of the double-lumen tube, I may need to place other lines — perhaps a larger calibre IV, or an arterial line to measure the patient’s blood pressure continuously. The nurse may need to insert a urinary catheter. When we’re done, we call for help to position the patient for surgery. This involves coordinating a team of operating room staff to turn the patient safely all the way onto one side, right or left depending on which lung needs surgery. We pad all the bony prominences — hips, knees, elbows — for comfort, putting pillows between the knees and positioning a padded axillary support to protect the nerves in the “down” arm. The nurse cleans the surgical site with antiseptic solution, and the surgical technician covers the rest of the patient’s body with sterile drapes. 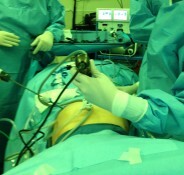 I recheck the breathing tube’s position with the fiberoptic bronchoscope. Now we’re ready for the surgeon. Surgeons remind me sometimes of racehorses. They are eager for the event to start, and impatient with anything that keeps them from bolting out of the starting gate and laying knife to skin. They’re perfectly willing to acknowledge that all the preparatory activities I’ve just detailed need to be done, and that the people doing them can’t be rushed too much or harm to the patient could result. But surgeons hate to stand around and watch — they pace, and mutter, and consciously or not, they put pressure on the OR team to move faster so the operation can start. Everything goes more smoothly when the surgeon is happily occupied in the case next door. Experienced teams know how to stagger the starts so that the surgeon is in the key portion of the first case during the preparations for the second. Once the critical work of the first case is complete, the surgeon can leave safely to begin work on the second one. The surgical technician and nurse begin the precise count of all the surgical instruments, needles, and sponges to make sure nothing is left inside the patient, while a surgical resident or fellow, or one of the surgeon’s partners, begins to close the wound. Once that’s done, members of the surgical team apply the dressing and reposition the patient for the wake-up from anesthesia. I make sure the patient is breathing well and all vital signs are stable, and then I remove the breathing tube. We move the patient from the OR table to the stretcher, and transfer the patient to the postanesthesia care unit. All these activities at the end of the case take time as well, and none of them requires the presence of the chief surgeon. Often, the team is more efficient and at ease when the surgeon is occupied elsewhere while the patient wakes up and everything is done to move the patient safely out of the operating room. Then the operating room must be thoroughly scrubbed down before set-up can begin for the next case. In most instances where I’ve seen surgeons running two operating rooms at once, safely and efficiently, the key surgical portions of the case are relatively short while the preparation time is long. A good example would be total joint replacements, especially hips and knees, where it takes time to set up complex equipment and place regional anesthetic blocks before the surgical team is ready for the surgeon. What about long spine cases, such as those detailed in the Boston Globe article? Whether scheduling those cases concurrently is a good idea isn’t as clear cut. It would depend on the specific situation. In surgical groups where partners have comparable skill and experience, it often doesn’t matter much which surgeon is listed as the primary surgeon and which one is listed as the assistant. They may work together consistently, and when they run two rooms, the quality of care is no different. In fact, it may be better in the sense that they can each perform the parts of the work that they do best, and relieve each other for brief periods during especially long cases. Should patients be told that surgeons have scheduled two operating rooms? Of course they should. And in my experience, they are. I’ve seen patients next to each other in the preoperative bays, chatting about the skill of their mutual surgeon and congratulating each other on their choice. They understand that the OR runs more efficiently when cases are staggered, and have confidence that each of them will have the surgeon’s full attention at the appropriate time. It’s important to recognize, too, that no one can become an excellent physician without years of training. That training can’t happen just by watching. Residents and fellows need to perform surgery under supervision, just as anesthesia residents and fellows give anesthesia and do procedures under my supervision. As long as supervision is appropriate, a recent study has demonstrated that quality isn’t in jeopardy. Reporters and the public shouldn’t rush to judgment about the wisdom of scheduling concurrent surgical cases. It’s important to understand how this long-standing practice may contribute positively to the overall performance and efficiency of the surgical team, and to the safety and well-being of our patients. Right on, Karen! 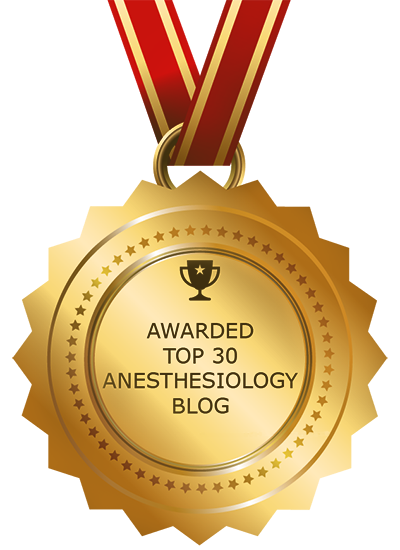 I’ve given anesthesia care for thousands of cases involving alternating orthopedic rooms with no detriment (and, as you’ve correctly pointed out, some benefits) to the patient. A productive, cautious and efficient total joint surgeon, with whom I spent more time on a busy day than with my wife, let the “other room” know when to bring the next patient into the room and when to commence anesthesia induction, and we worked together so much that this arrangement worked very well with no harm to the patients. Communication is the key to safe, efficient care. So lovely to hear from you! I’m sure there are instances where running two rooms is done unwisely, or is abused, but my experience has been similar to yours. Well said Karen. I wish people who are not in the trenches would withhold their commentary on things they have limited knowledge of. A sign of true wisdom is the ability to reserve your commentary on things in which you have little true knowledge or at the very least provide a clear disclaimer stating that your opinion is based on your perception with little true knowledge. Of course that would betray the arrogance of the writer to portray himself as an expert and spokesman and malign others with sweeping generalization. The masses are not served by sensational misinformation and to perform this disservice goes beyond a writers innocent self promotion and search for relevance and can only be regarded as malintent. I shared this post with a good friend and her adult daughter who recently had complex surgery at MGH and is scheduled for another one in March. We had just discussed the article and I tried to argue there might be good reason for double booking. Your inside perspective makes the case much more persuasively. I suspect not only your medical, but your journalistic credentials trump those of the Globe reporters and editors. see you tomorrow at 11 am on the show. This is excellent stuff!